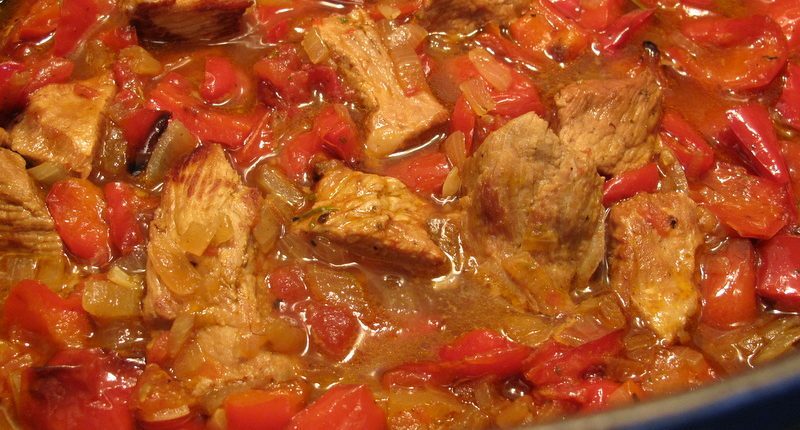 While I adore making a delicious classic Blanquette de Veau from the Ile-de-France in winter, the family also loves this warming Corsican Veal Stew with Red Peppers. 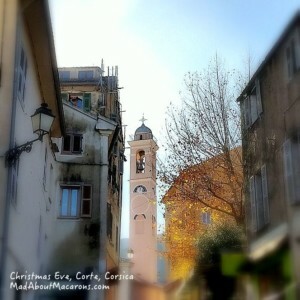 As you may know, my husband is from the beautiful island of Corsica and so every second Christmas we join his family either in Provence or at the family house in the village in the Corsican mountains near Corte. Believe me, either it can be mild or even much colder than Scotland! This past Christmas Eve, we snaked down the long winding road to Corte to pick up a few things for the reveillon dinner: fresh oysters, a few baguettes, and a greedy few logs of Bûches de Noël from Grimaldi’s pâtisserie to keep the family sweetly content over a couple of days. With bells peeling, light struck the church tower and the last of the golden leaves clinging to the branches glistened like threadbare tinsel. A crouched elderly Corsican woman dressed head to foot in black scuttled into her house just after I took this shot of the Church. She must have been running in to check on her stew (known as a Stufadu in Corsica), as I could smell the most gorgeous fragrance wafting from the front door. The most well known Corsican Stufadu is made with beef and dried porcini mushrooms – something I’ll post later. 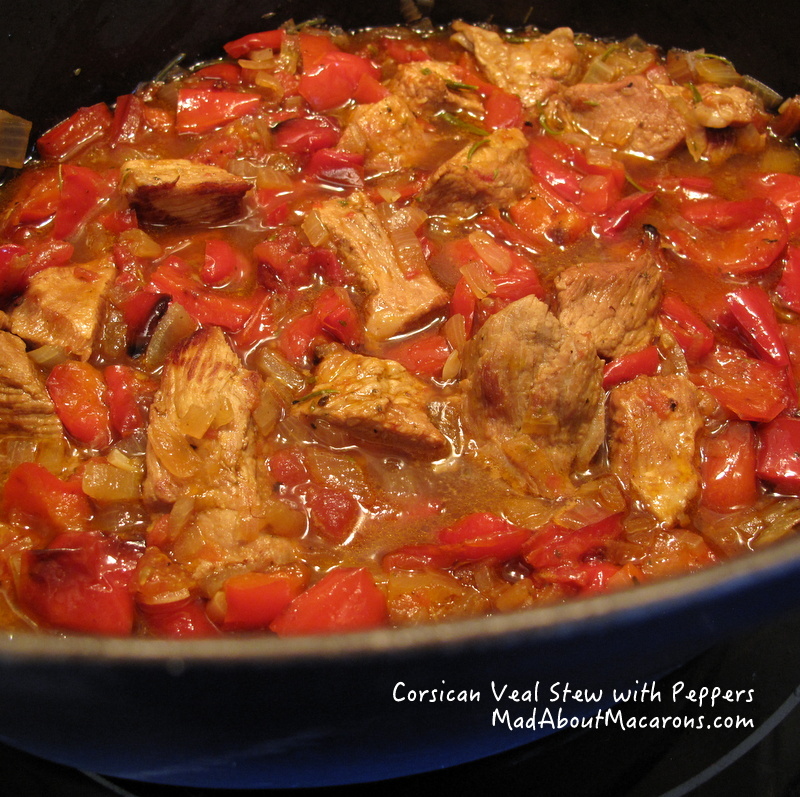 I picked up this Corsican Veal stew with Peppers from Rolli Lucarotti’s book, “Recipes from Corsica”. It reminds me of a Veau Marengo, invented in the Ile-de-France for Napoleon (even if it was originally chicken) but instead of adding pickling onions, carrot and mushrooms (also like in a Blanquette), this is a slightly lazier version. Here I’ve slightly adapted the recipe by adding more wine, so that I don’t need to check on it during cooking for fear of drying out. 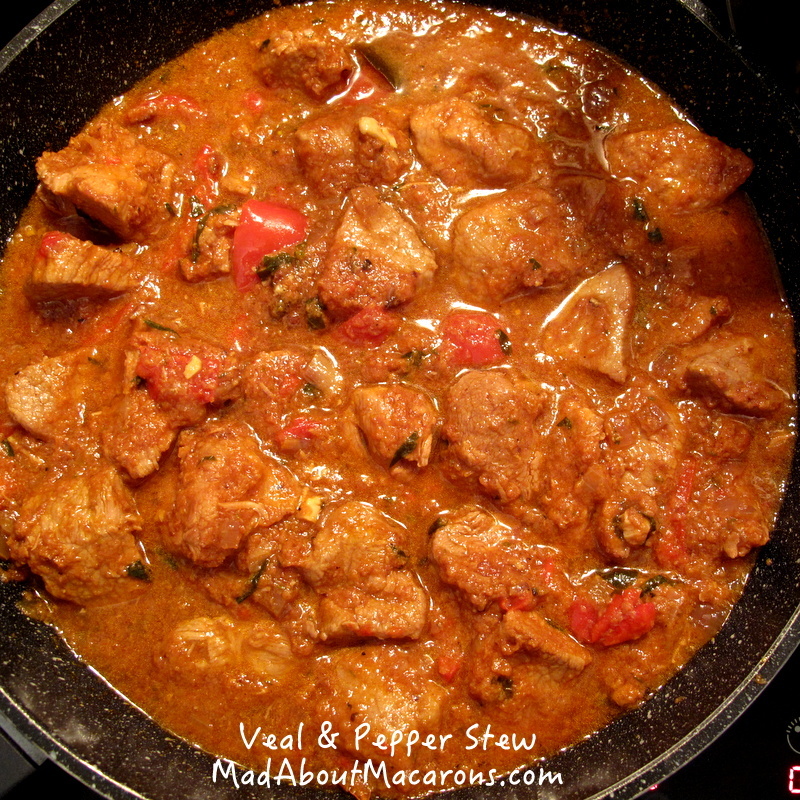 I’ve also used red peppers instead of green, more garlic (because the world needs more garlic! ), plus a hint of flour just to thicken it slightly. Pasta lovers will enjoy this served with Penne – and the good news? It freezes so well that I make double quantities: freeze half so that it’s so easy to whip up a home-cooked weekday dinner and everyone will think you’ve been busy in the kitchen. That way you can make time to bake! Don’t forget to sign up to the new email alerts (daily, weekly or monthly) so you never miss a post! Trim the veal of any fat and cut into 5cm (2-inch) cubes then coat lightly in the flour. Heat the oil in a non-stick crock pot or casserole dish. Add the meat and cook over a high heat for about 10 minutes until very lightly browned (read golden) on all sides. Remove from the pan, leaving as many juices as you can, and set aside. In the same pan, lower the heat slightly and fry the onion and peppers until soft. 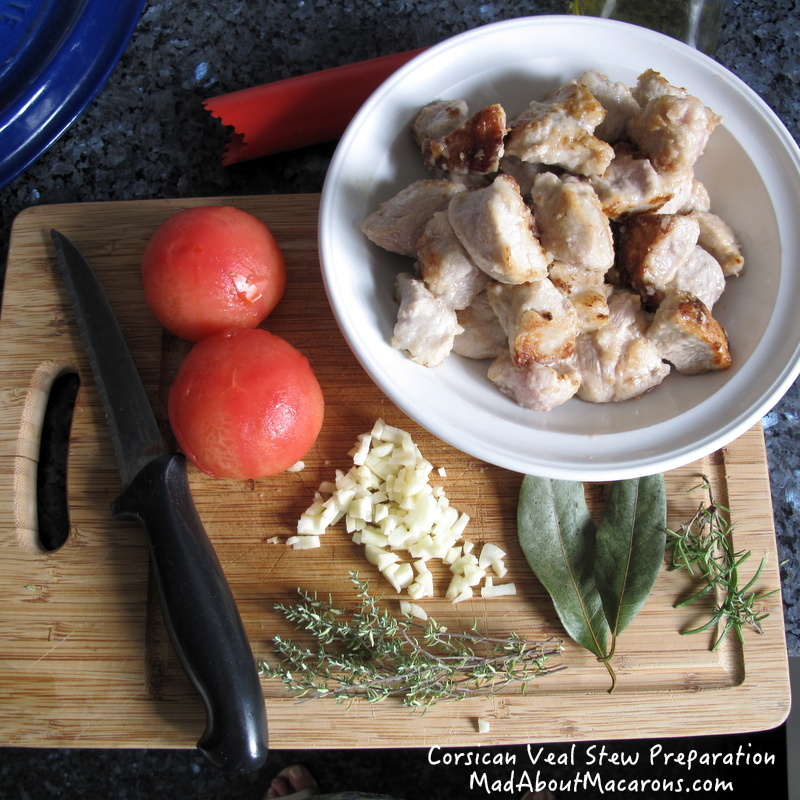 Return the meat plus juices back to the pan, adding the tomato, herbs and wine, then season with salt and pepper. Bring back to the boil then immediately turn down the heat. Cover and simmer for 1.5 hours. Remove the herbs before serving and add a touch of freshly chopped parsley to serve. This stew freezes very well – so I normally make double quantities and freeze half: ideal for hearty pasta dishes during the week at the drop of a hat! If you prefer that this is gluten-free, replace the flour with half quantity cornflour/cornstarch – or, even better, chestnut flour. Did I see this on Instagram? I think I did – and I think it made me start salivating right away. The one thing I have not made since our move to Tucson is anything with I veal shoulder. It seems impossible to find here. But I’m going to try again, because I want to make this soon, Jill! Hi David – yes it was on IG. And I understand veal isn’t that easy to find but in France and Italy it’s so popular, so I hope you don’t mind me posting this. Hope you try it as it really is worth it! Another lovely wintertime meal, Jill! This is totally comfort food and I love that it can be frozen for 2 meals in 1! I really enjoyed your description of the Corsican village scene; it reminded me of where my mum grew up. Thanks for sharing all your wonderful travel experiences and fabulous recipes! You’re a gem! Thanks so much, Tonio. Pleasure!